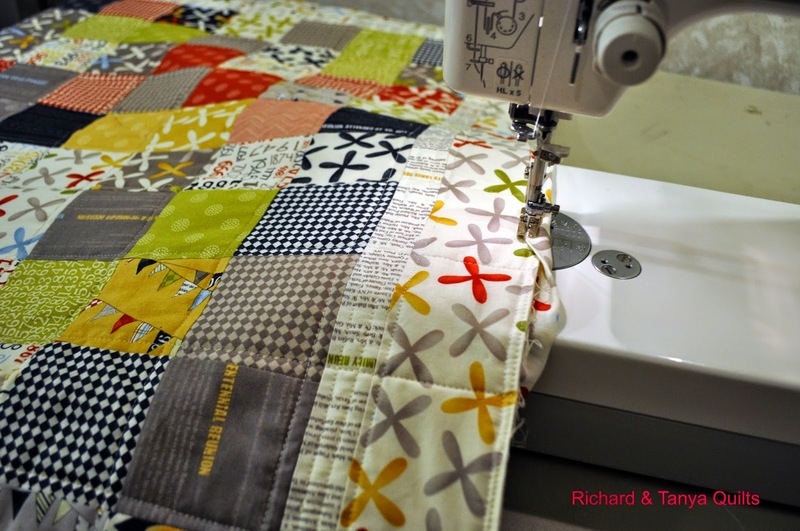 Today is a quilting day. 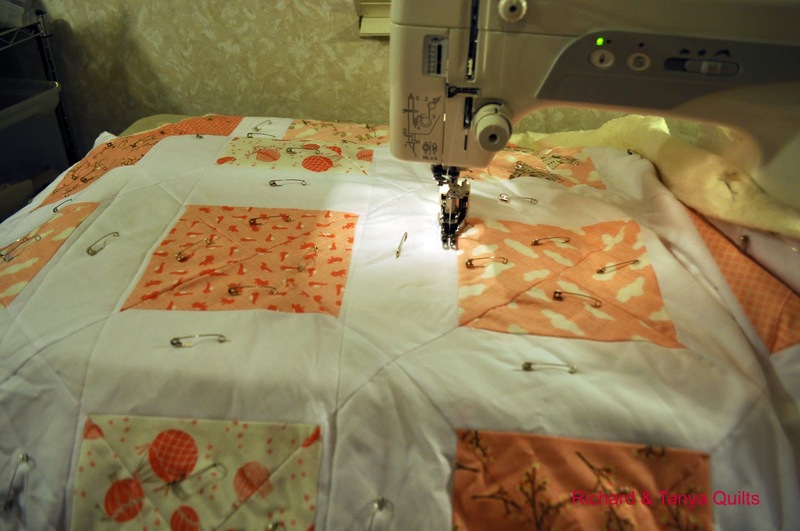 I start above quilting one of our very simple square quilts. 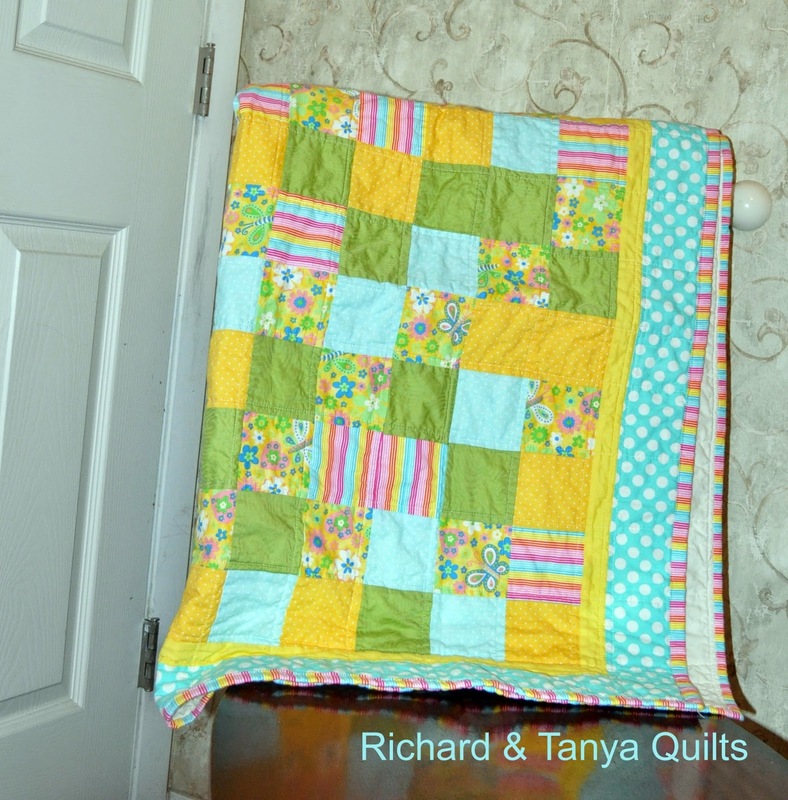 Tanya had me make these simple quilts to see how they sell compared to some of the more complex quilts on Etsy. 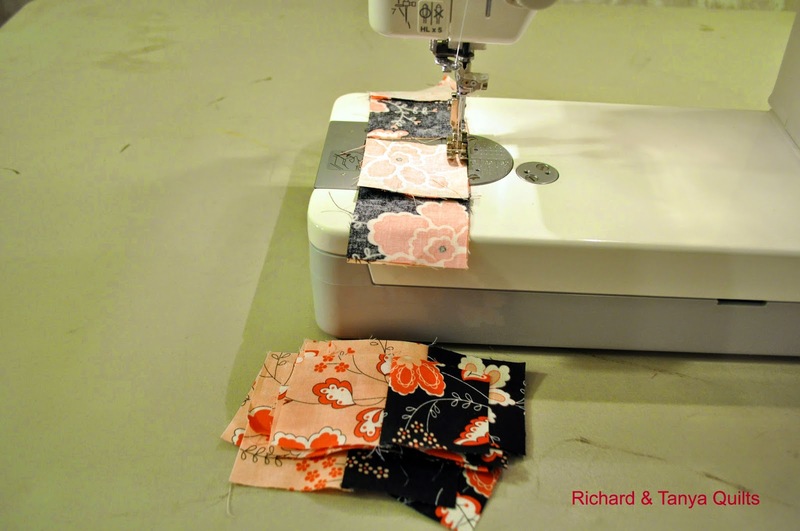 As they are simple to make they will be priced a little cheaper. 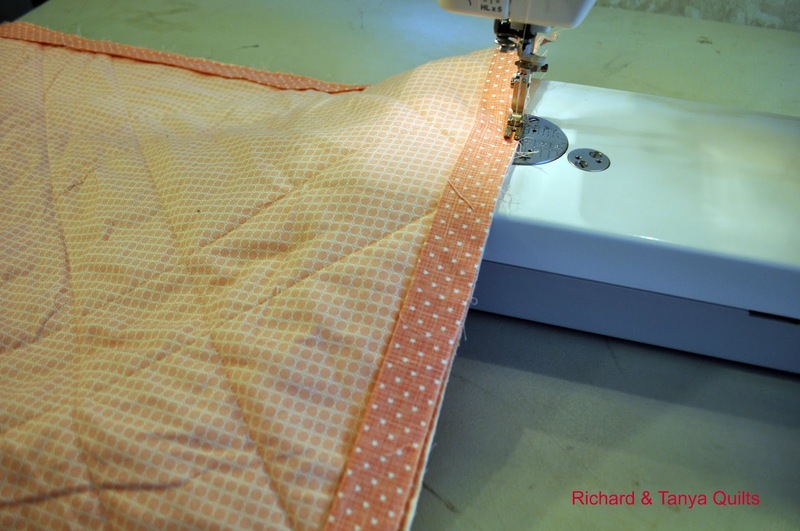 I got to quilt and bind my peach quilt for our new Diamonds pattern. 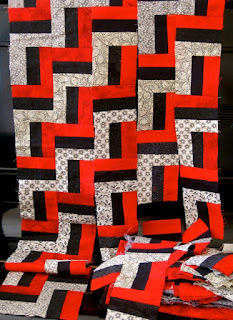 Hum I guess I can't call it a pattern yet as I have not wrote it. I should really do that soon. 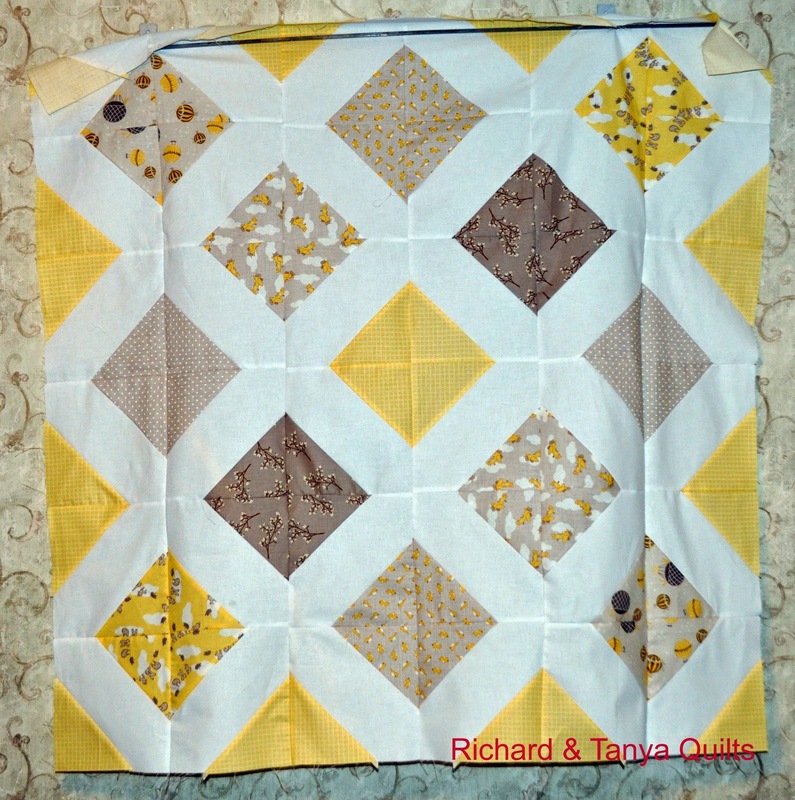 I also quilted and then bound the yellow and brown version of the same quilt. 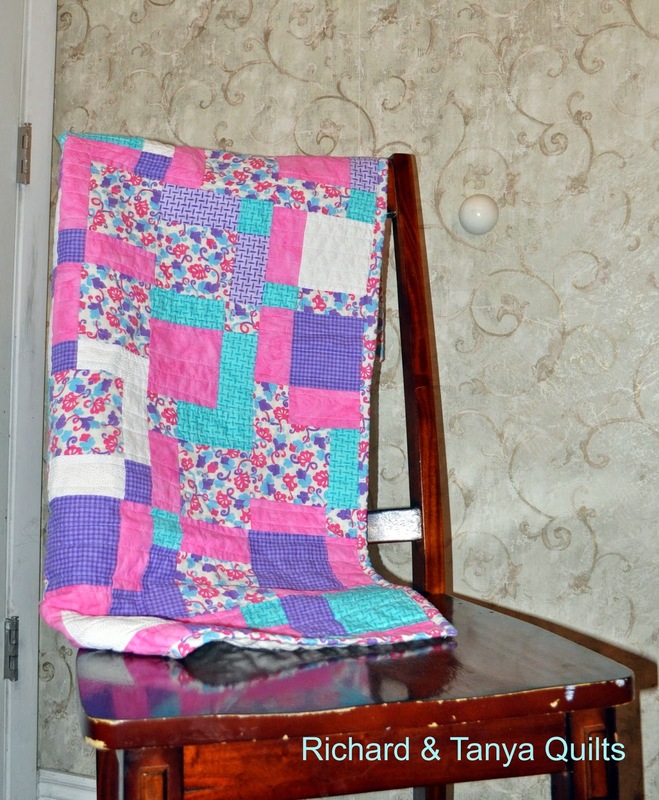 The first one I quilted more simply then the 2nd. I am curious which people will like better. 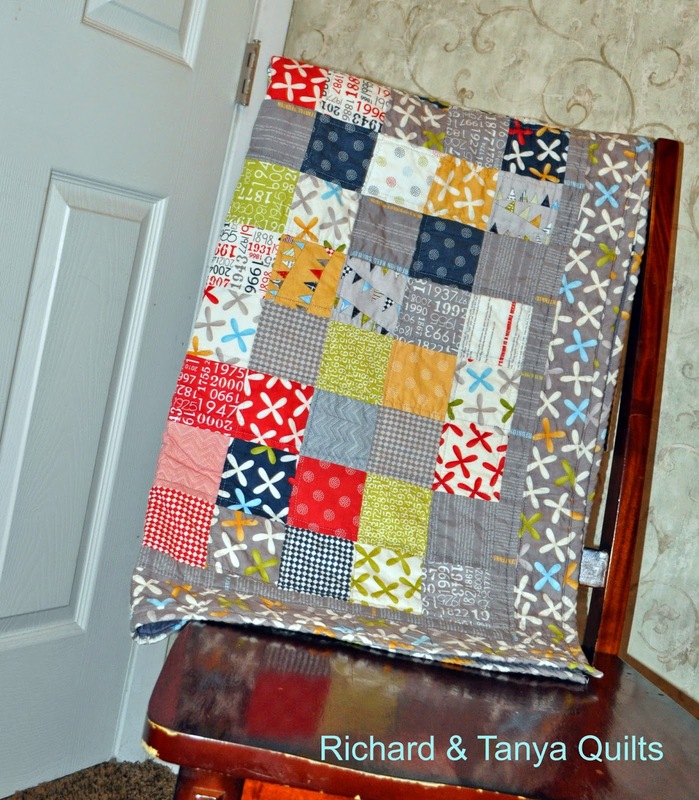 Tanya and I went though our quilt stash and realized we have almost completely sold out of our rag quilts. So we have set to cutting up the bolts (yes bolts like 5 of them) and many other smaller cuts of flannel that we have. 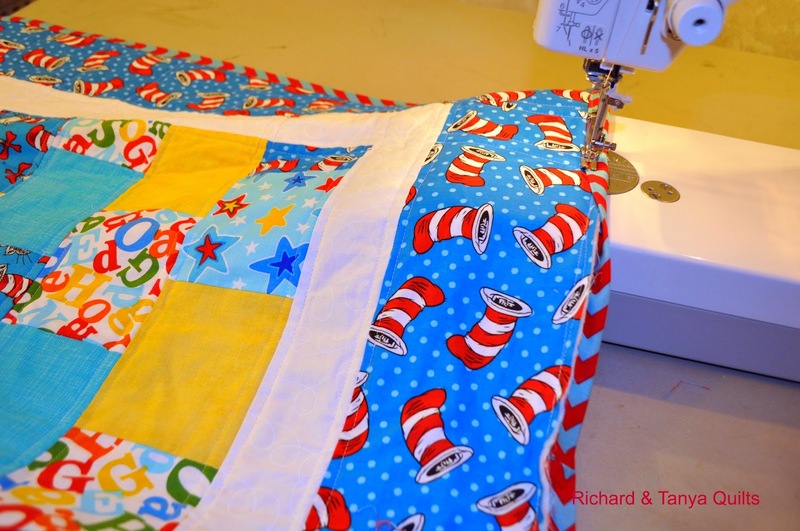 We are making kits for me and the kids to sew X though. 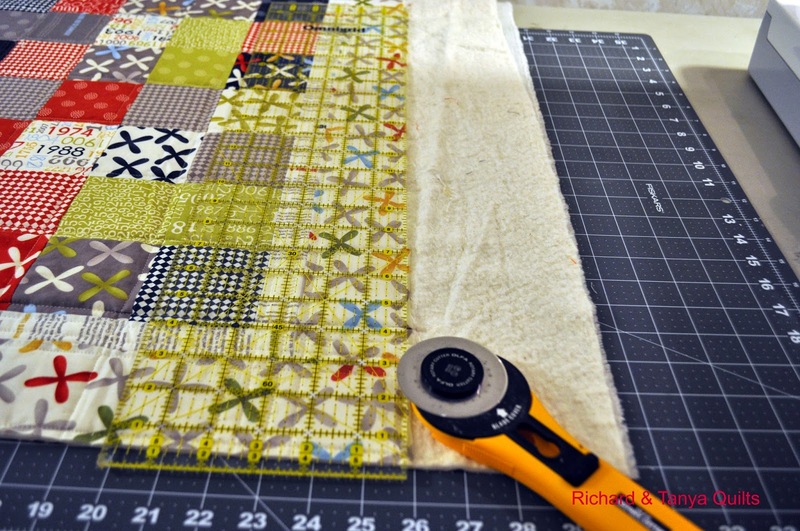 We realized before we got far into cutting that we have materials for like 20-30 quilts. 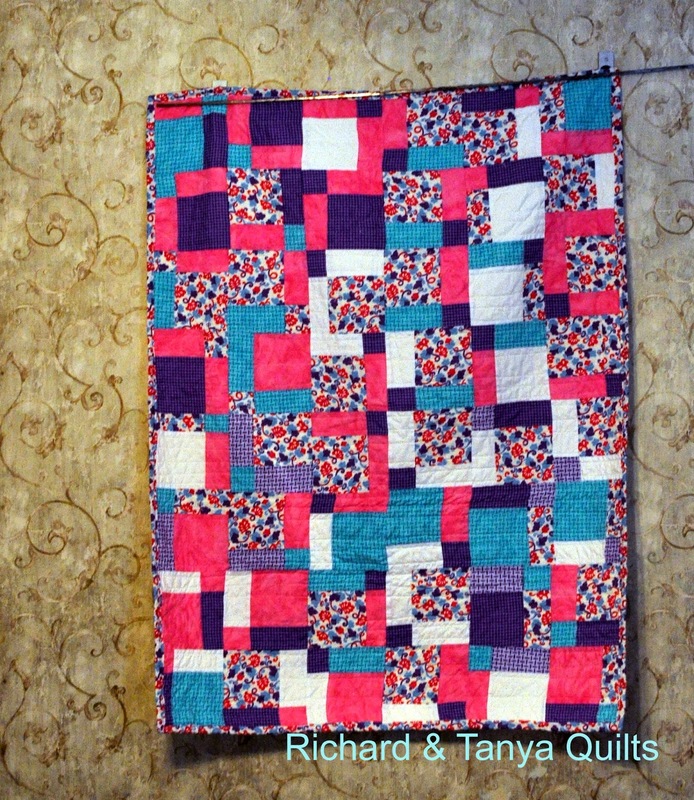 I love the reunion material and here is another fantastic quilt made from it. 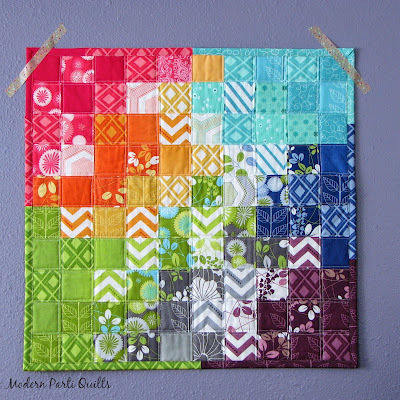 This is our Simple Squares pattern that we sell on Craftsy. 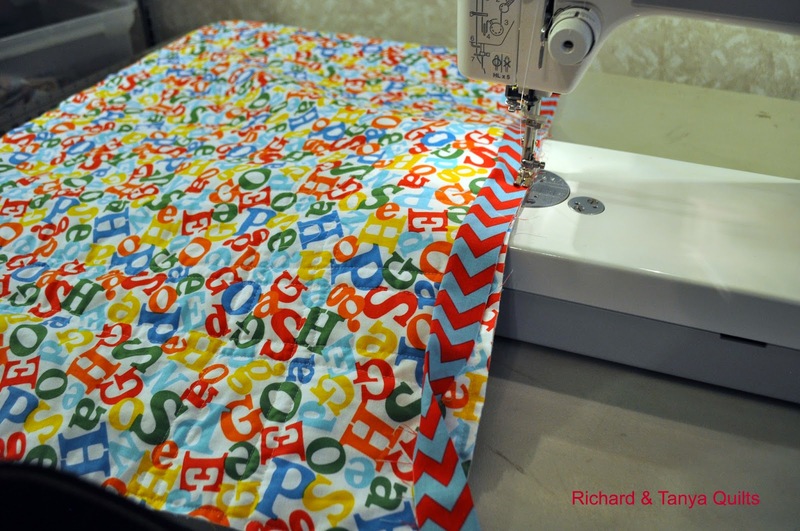 This is another quilt that will show up on our Etsy Store. 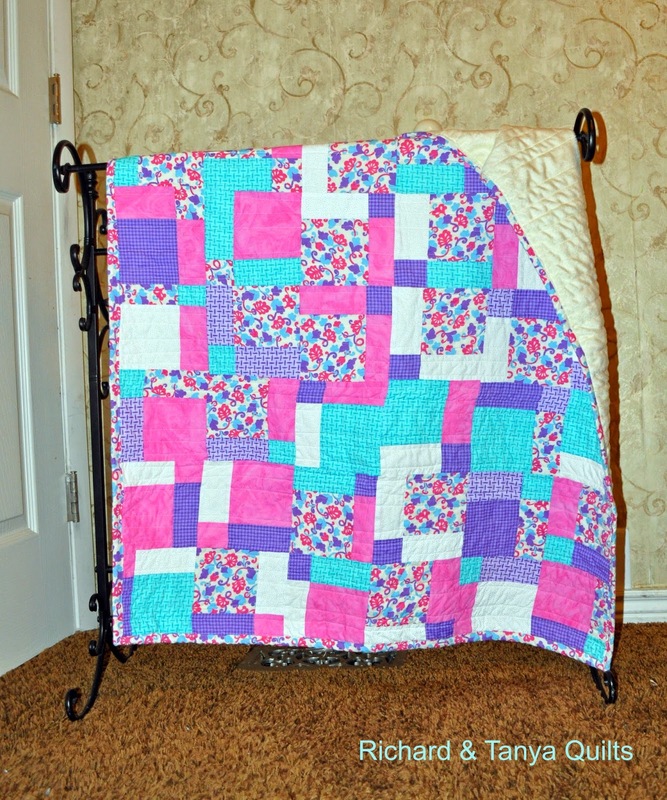 The above quilt is a Baby Bricks Quilt and the below is a Simple Squares Quilt. Both are patterns we well on Craftsy. 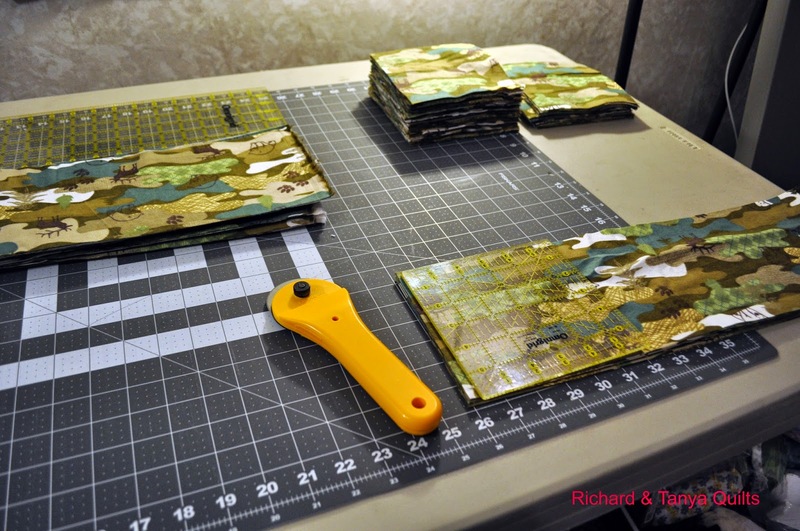 Since I was doing bindings I decided to get the other reunion quilt trimmed and bound also. 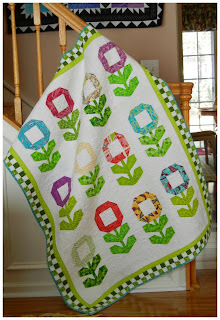 Lastly today I made a new Windows Quilt out of our Pattern that we sell on Craftsy. The colors in this picture does not give it justice well above you can see more what it looks like then below but wow does it pop cant wait to finish it and get good pictures. 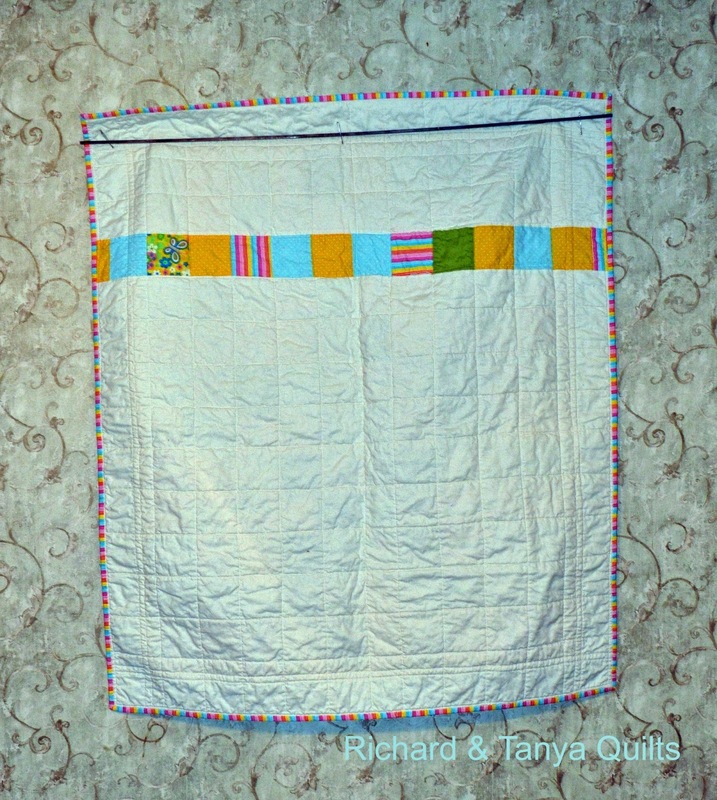 This is a quilt top that was made by Tanya. 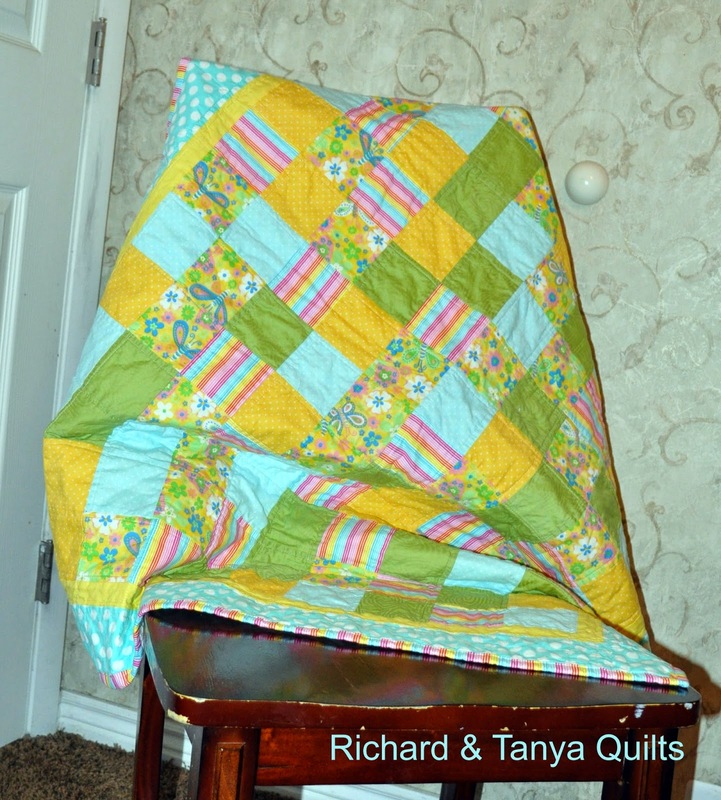 She put minky on the back and had me quilt it. 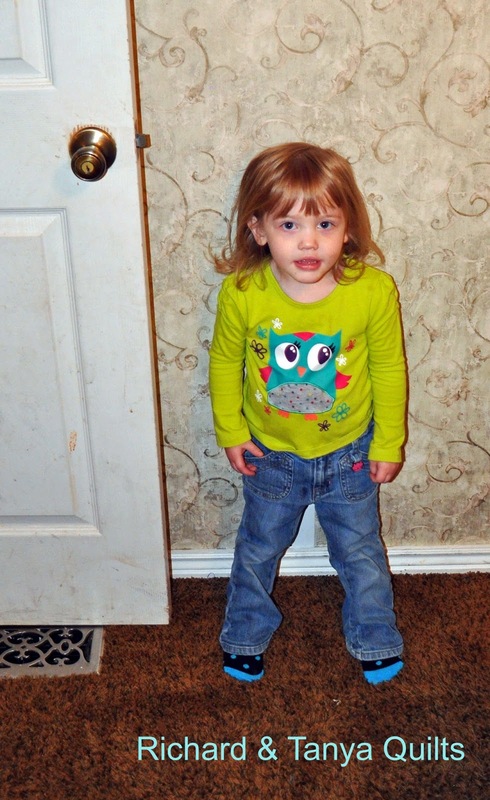 As you can see from our pictures we had a hard time with the colors on this one. I really thing the colors look better in real life most likely the brown wall behind it is why it had such a hard time but great quilt from Tanya. 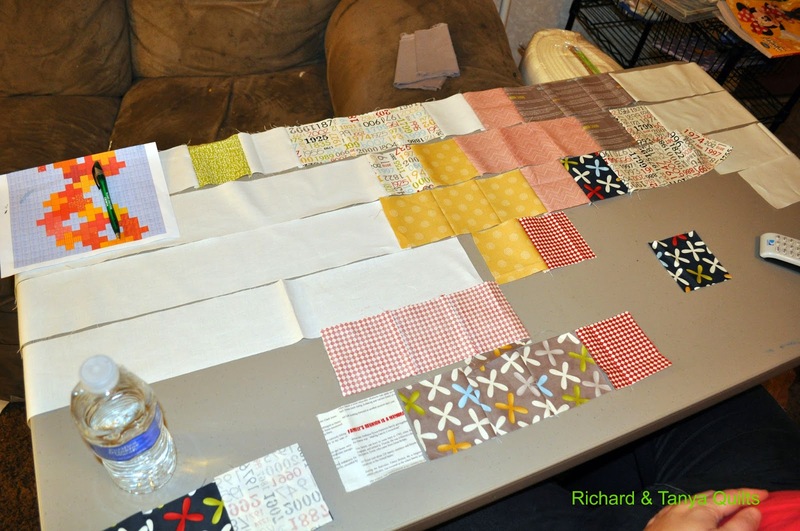 Today consists of making quilts out of a new pattern Tanya Designed on EQ7 I took many pictures as I plan to make a pattern for Craftsy, so here I will only show a few of them. The above came from her design called Diamonds. 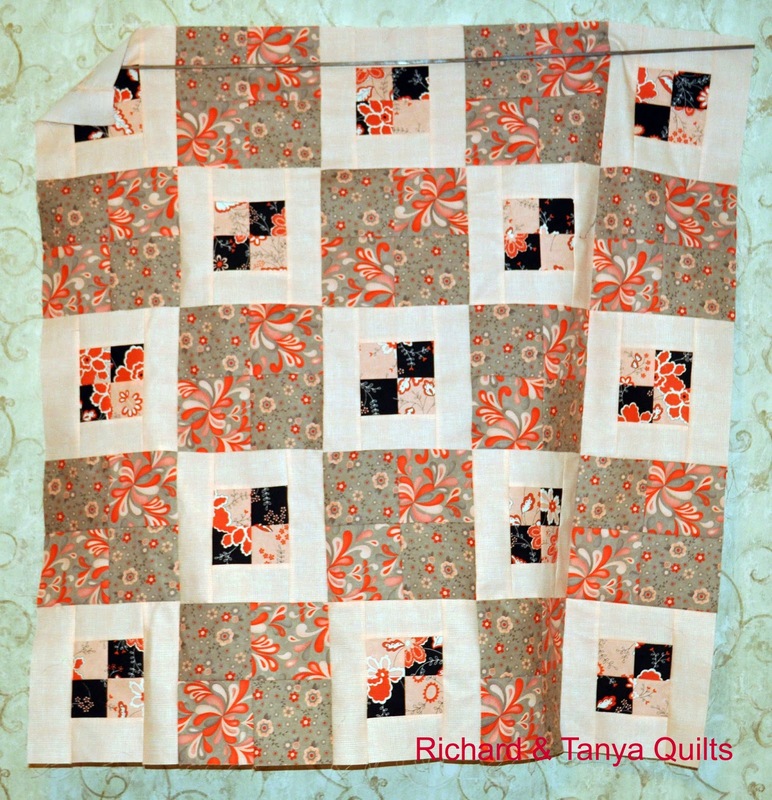 The block she picked was hard for me to decide how to make as its not like blocks I have done in the past. 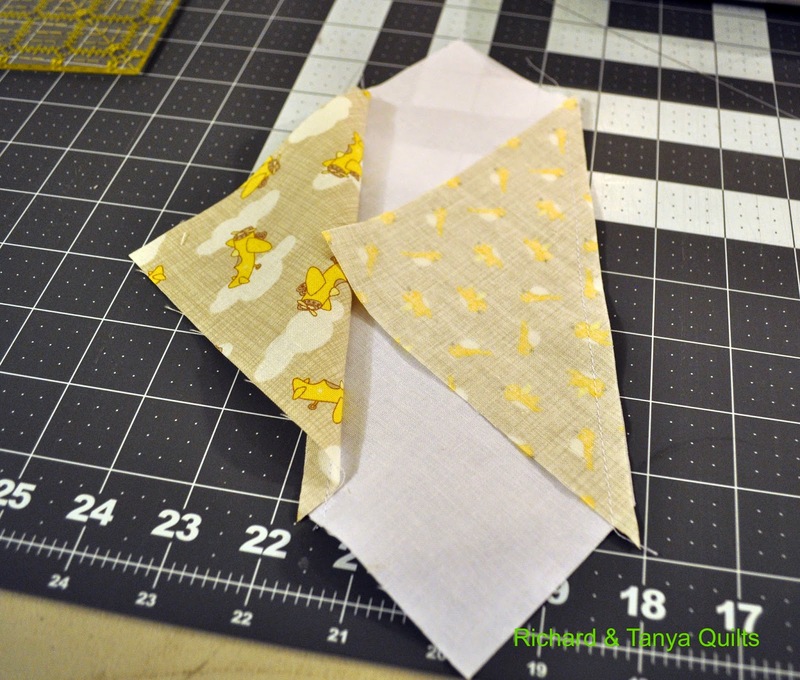 Its basically a arrow point with 2 HST sewed to the side, but it did look cute when done. 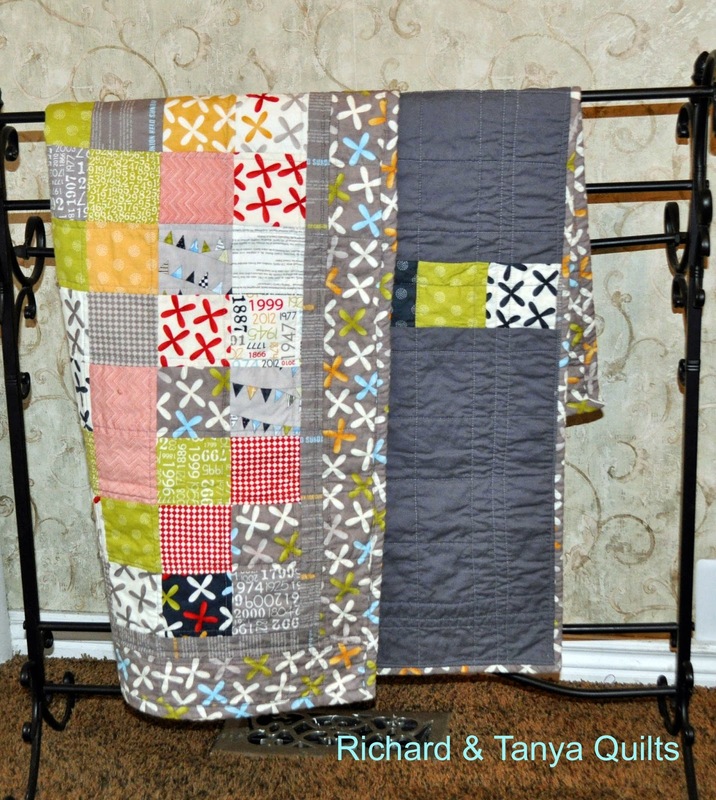 It was a puzzle making this quilt as I had to make sure the correct blocks matched the 2 different outside pieces. But when finished they looked nice. Oh did, I mention that I made 2 of them at the same time? I let my photo shop auto fix colors and it ruined them. 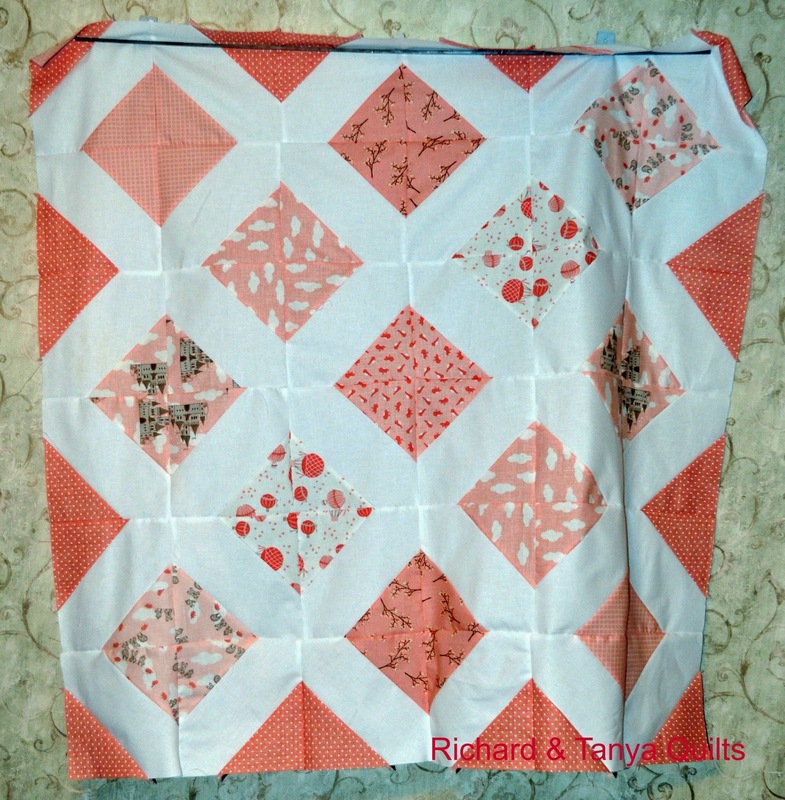 You will just have to trust me the top one is closer to correct colors the bottom is a light peach and you will have to wait tell the quilting pictures to see its true color. 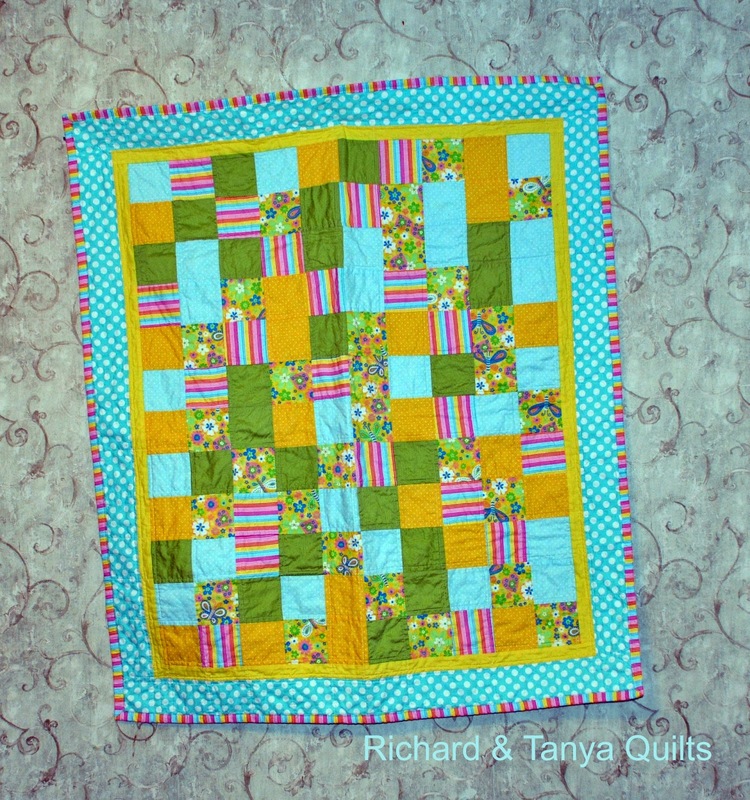 This quilt was made mostly from stash with only buying aqua dots for border. Julia came in room while taking pictures. She wanted one of her taken. 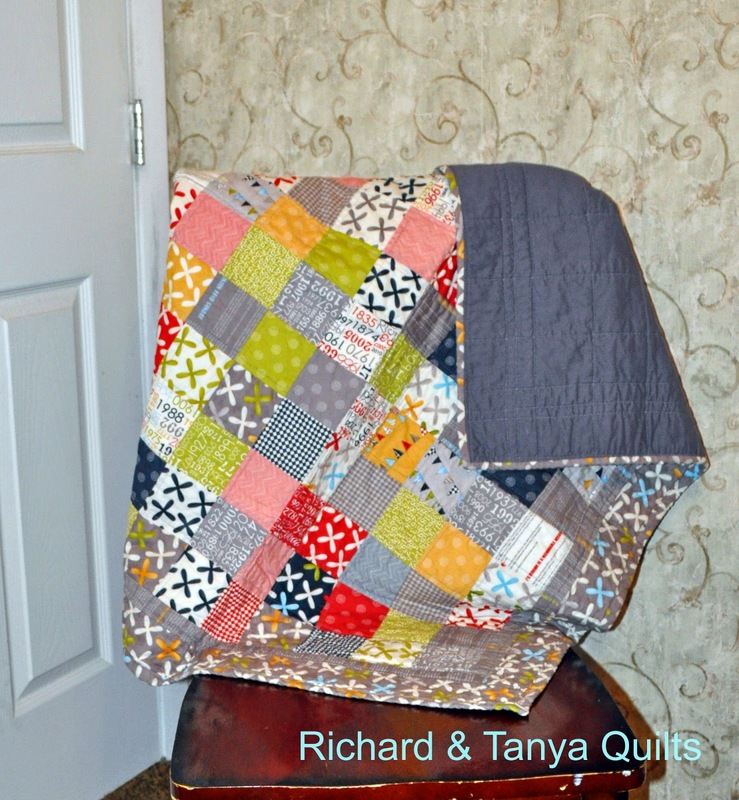 It is always rewarding to make a quilt almost completely from stash leftovers. 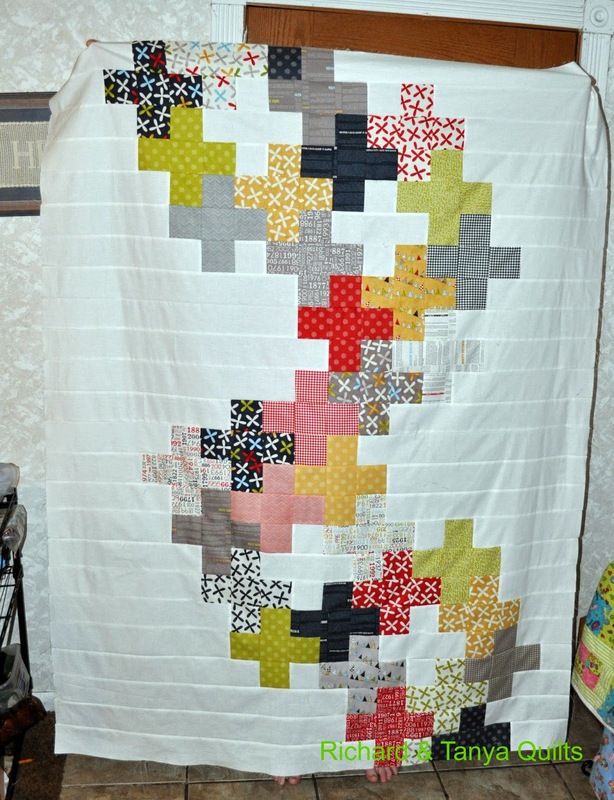 Well its time to get to work on the Helix quilt. 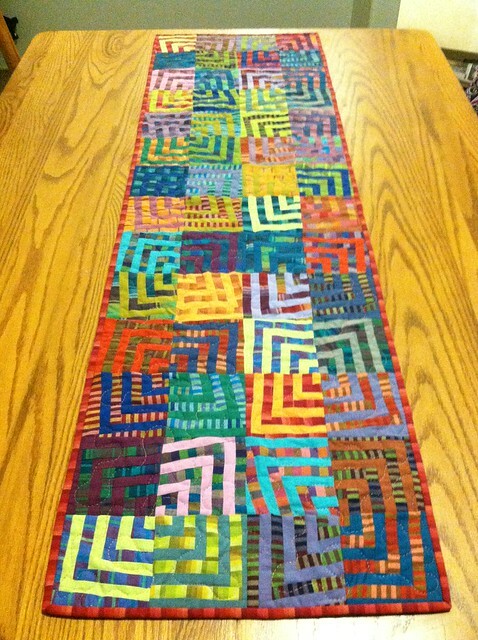 This quilt is far more effort then some of the quilts I do, but that effort pays off in the end. 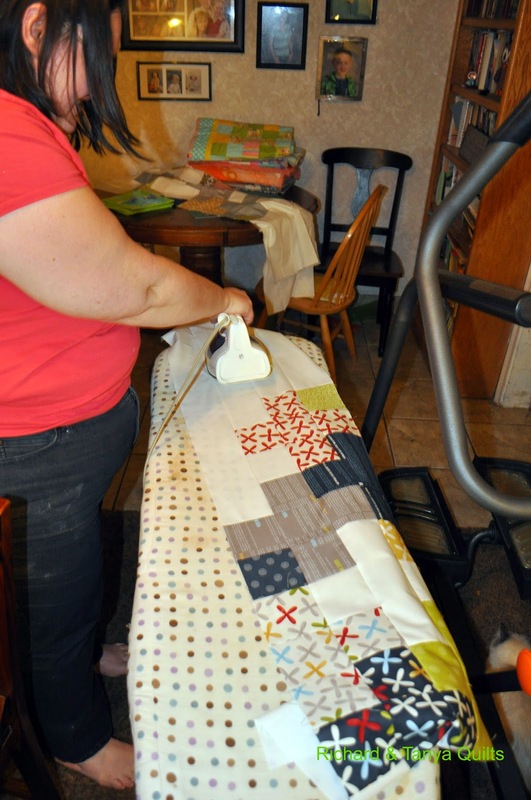 You can see above us putting the puzzle together and below Tanya ironing it out, to make it all look wonderful as I sew the blocks and rows together. 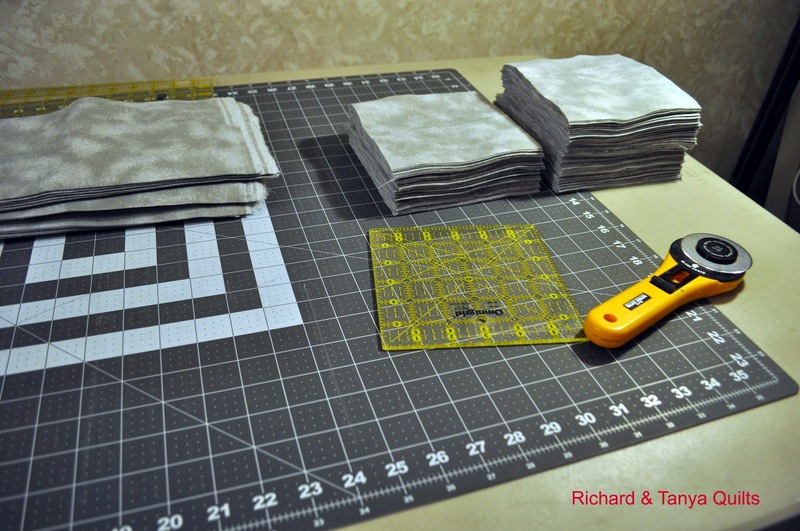 The first 2 quilts I cut all of it into 2 1/2 inch squares even the empty sides. 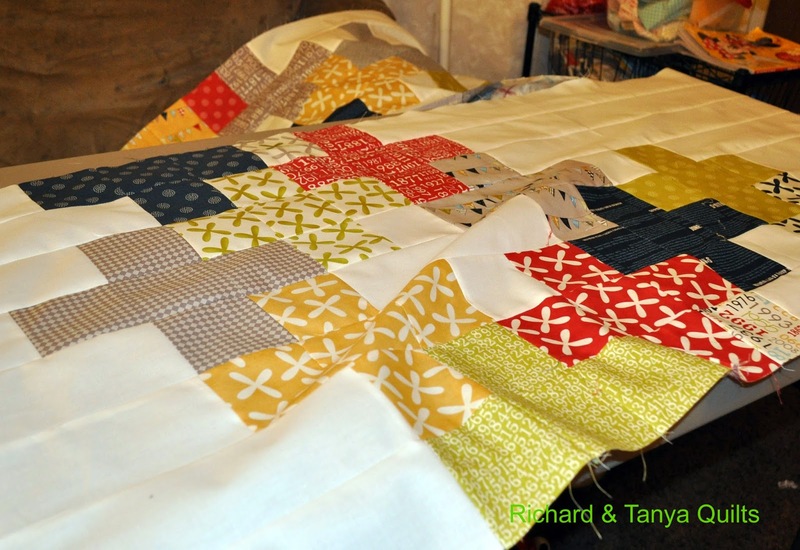 Tanya convinced me this time to do just rows of white and I am eager to see how the finished quilt will look. 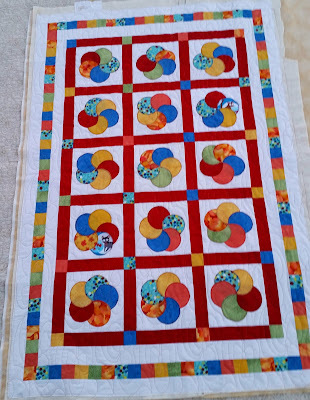 This quilt is far bigger then my first where it had 2 1/2 inch squares and these are 3 1/2 inch so it is much larger which will make it a better lap quilt. 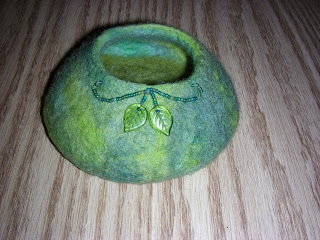 Here is Tanya hold it up by the door. Don't ask why I have 2 of the same picture but I am too lazy to delete it> Though they are different pictures they show nothing different. Well it is valentines day today so I suppose I must start with some hearts. 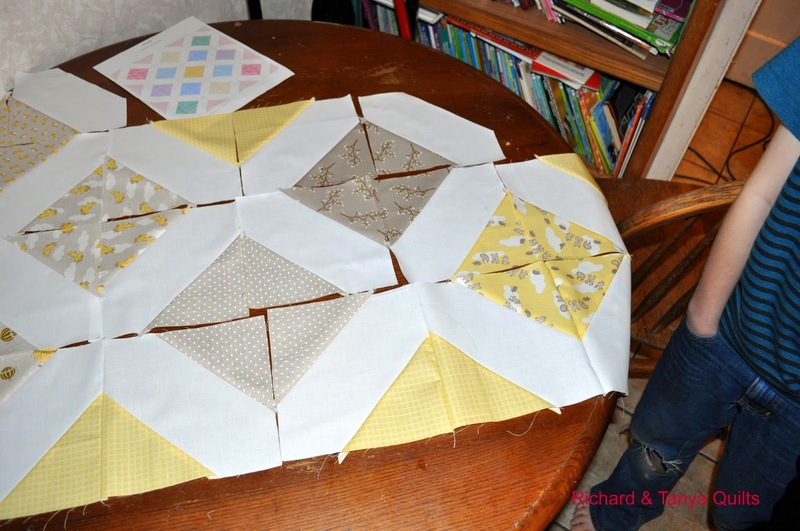 These are not original they were mock ups I made back in 2013 for a quilt I made for my wife. That post can be found here. 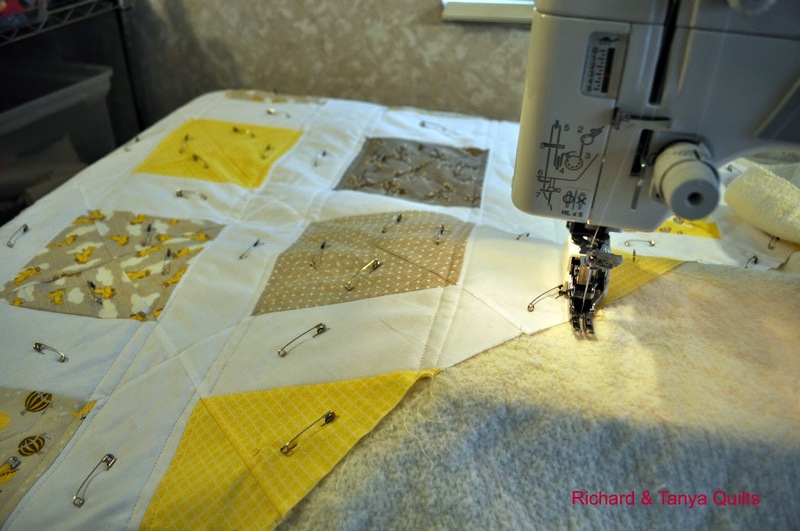 Even earlier then that back in 2013, we decided we were going to make some quilts with hearts in them and well it of course cased me to make a funny post about it called Tugging on my Heart Strings you can read it for more info. 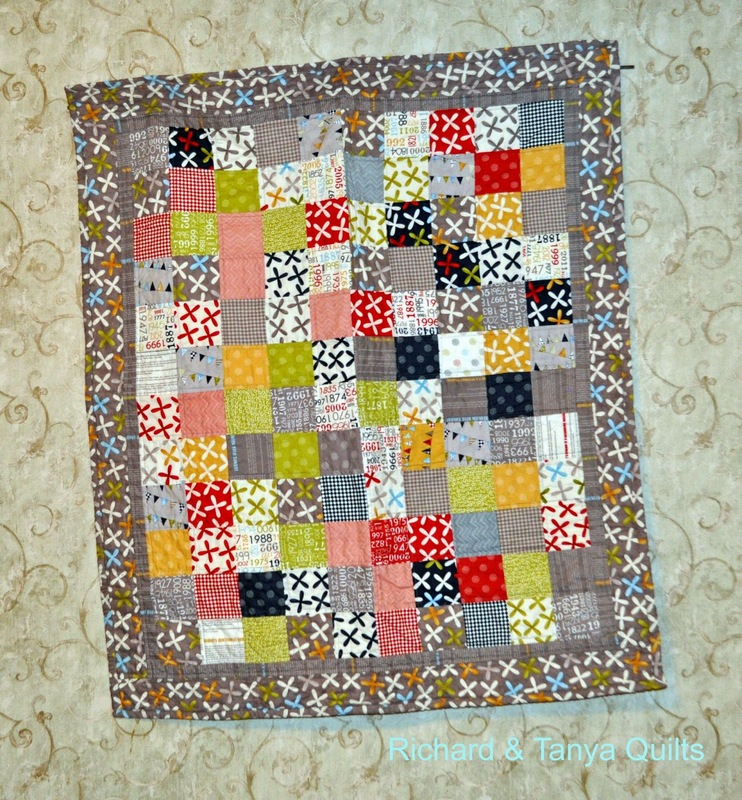 Those hearts eventually made it into a quilt and well I guess I should show it off as well it has more hearts. You can read more on that here. 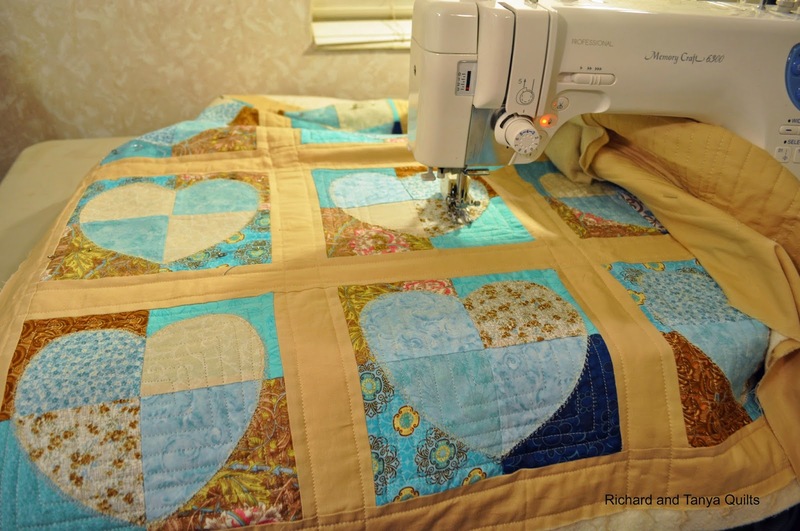 Hearts are great and as such we have even applique a few in the past into a rag quilt. 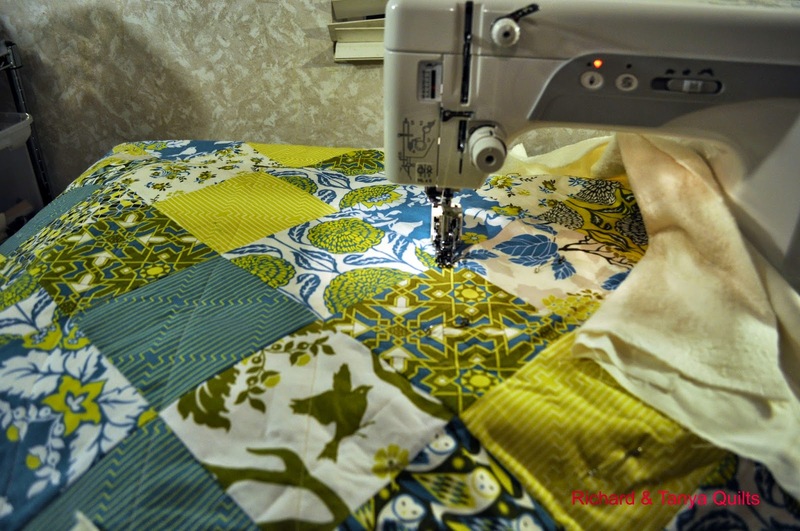 More on that quilt here. 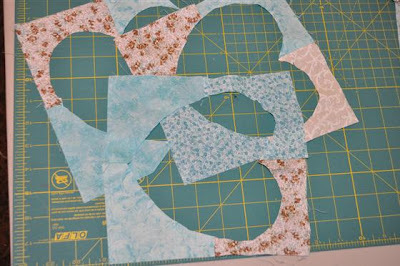 Of course some times you just need hearts in the material print. 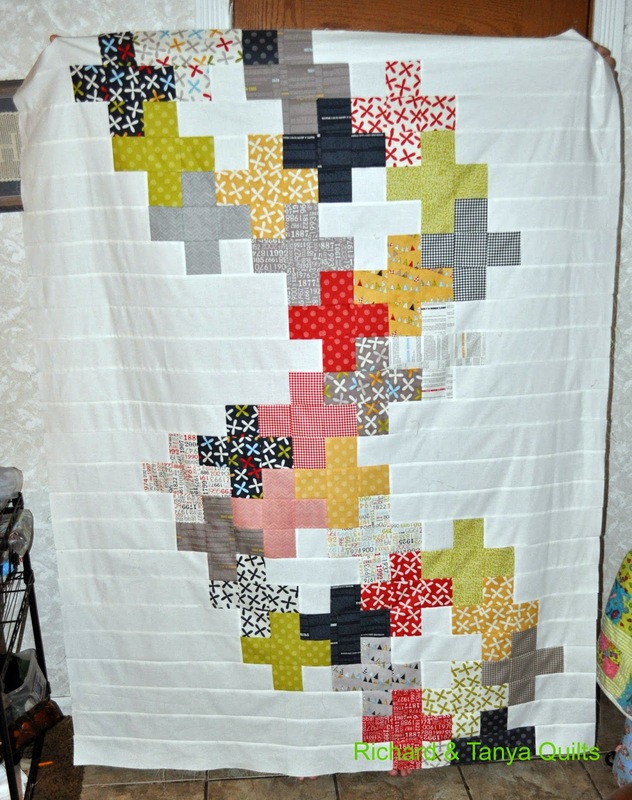 You can read more about That quilt here. Well Sadly I have nothing new this year for Valentines Day. I do love my wife and would like to wish her a Happy Valentines even if she gets nothing from me (I am not a big present buyer) I love her all the same.